Unrestrained joy on Palm Sunday? It was appropriate that Tiger Woods should have won the US Masters golf tournament on Palm Sunday. Pretty well all of us know the Bible account of how Jesus entered Jerusalem on a donkey, with the people strewing palms before it and singing the praise of the Messiah. Euphoric is as good a word as any to describe the Biblical scene. So too yesterday. The many live pictures coming in from Augusta showed the crowd totally identifying with Tiger Woods,willing his shots to land where he wanted them, punching the air and applauding as he advanced to glory. But if we fast-forward the Bible story, we’ll know that Palm Sunday is followed by the mob turning on Jesus, his most devout followers scurrying off or denying they even knew him, before the chants of “Crucify him!” ended the public’s love affair with him. But while in the Bible pain and betrayal followed the praise and elation, the delight and applause for Tiger Woods followed his 10-year crucifixion. Remember? Late-night presenters used to do jokes about him the way they now do about Trump. The details of his marriage breakdown were laid out for all to mock. And wasn’t there that hilarious scene when his wife went out with a golf club and smashed up Tiger’s car? How we laughed. So it’s no wonder that Tiger’s triumph was celebrated in a relatively low-key way by the man himself. Arms aloft once, the dazzling smile showing through from time to time, but a muted performance from a man who’d just done what was believed impossible. I wonder if, deep down, Tiger doesn’t have something approaching contempt for the fickleness of his many fans. “Nobody love you/When you’re down and out” – wasn’t that the old song? 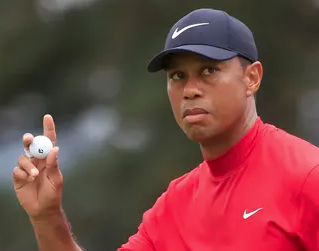 Now that they’re loving the man they used to hate, they need an excuse for their contradictory attitude, and so Tiger’s victory is being hailed as “redemptive” and he is being portrayed as a new man. Nah. Maybe wiser and a little sadder about the fickleness of public adulation.